Black scientists in the US are much less likely to be awarded funding than their white counterparts, says a US government research-funding agency. The National Institutes of Health said that out of every 100 funding applications it considered, 30 were granted to white applicants. This compared with 20 to black applicants. The study, published in the journal Science, found the gap could not be explained by education or experience. It suggested small differences in access to resources and mentoring early in a scientist's career could accumulate, leaving black researchers at a disadvantage. Black people make up 13% of the US population, but only 1.2% of lead researchers on biomedical studies are black. The NIH said concerns over this prompted it to commission a study, which was led by University of Kansas economics professor Donna Ginther. The research - which was published on Thursday - examined submissions for NIH grant applications by more than 40,000 researchers from 2000-2006. The study found that 71% of grant-seekers said they were white; 1.5% said they were black; 3.3% were Latino; 13.5% were Asian; and 11% were identified as "other" or "unknown". NIH director Francis Collins said it would take action to address the potential for "insidious bias" in the grant process. "This situation is not acceptable," he told reporters in a conference call. "The data is deeply troubling." When applicants send proposals to the NIH, they identify their race, ethnicity and gender. This information is removed from the application before the materials are sent to review. Mr Collins said it was possible that reviewers could guess the race or ethnicity of an applicant by looking at names or where they trained. He said they would look at reviewing grants on the basis of scientific merits alone, without requiring information about an applicant's qualifications or background. 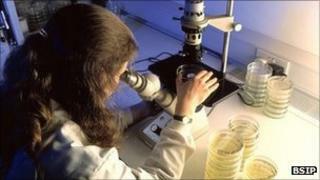 The NIH is the largest source of funding for medical research in the world, disbursing $30bn (£18bn) each year.